Profile: Nightbeat is a tough, no-nonsense type who is not afraid to break the rules to get what he wants. And usually what he wants is the solution to some complicated mystery... and he'll go anywhere to get it. He feels as comfortable driving down a dark alley as he does cruising along a six-lane super-highway. He has an intuition for finding the truth that defies all known theories of programming. In trying to account for Nightbeat's remarkable talent, Optimus Prime suspects that the circuitry in the digital detective's logic center may accidentally have been wired in a way contrary to accepted robotic engineering procedures. But the Autobot Leader is still at a loss to explain why Nightbeat thinks the way he does. Nightbeat prefers to work alone. Most partners don't understand his methods and his reasoning, and often wind up hindering his investigations more than helping them. But being a good soldier, he doesn't complain about his fellow Autobots... instead he tries to compensate for their investigatory deficiencies by working even harder. He is binary-bonded to Muzzle, a human who worked as a detective on Nebulos until he was framed in a scandal that put him out of business. When he found out that an Autobot with training in detective work was looking for a Nebulan partner, Muzzle immediately volunteered. He considered this an opportunity to continue doing what he loved to do the most. After undergoing the bio-engineering procedure that allows him to convert to an Autobot head module, Muzzle quickly discovered that he and Nightbeat have one of the smoothest-working binary bonds among all the Headmasters. Muzzle's eye for detail makes Nightbeat an even better detective than he was without him. 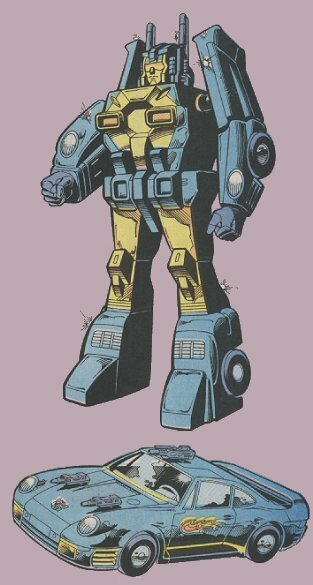 Abilities: Nightbeat carries two photon pistols and a high-powered plasma blaster with infra-red sight. He also has enhanced audio and video sensors that aid in his investigatory work. From five miles away, he can hear a screw fall and count the threads on it. In car mode he can travel at speeds of up to 620 miles per hour and has a range of 1500 miles. Weaknesses: Nightbeat's overconfidence in his abilities typically persuades him that he can handle almost any situation by himself. Given his preference for working alone, he often suffers damage that a more team-oriented Autobot might avoid.